Abstract: The dental surgery induces some degree of anxiety in many patients: 12% of the UK adult population who had visited a dentist were extremely dentally anxious. Such patients can be unco-operative and difficult to manage as they avoid dental visits and suffer a greater amount of dental disease. Furthermore, patients believe that their oral health has an impact on their quality of life. Sedation is an option to relieve anxiety, however this is associated with risks, including respiratory depression and over sedation. Erdal et al found that music was as effective as midazolam in terms of its sedative and anxiolytic properties during surgery. Clinical relevance: Music has demonstrated its usefulness in terms of calming anxious patients. Author notes: Ashana Gupta, BDS (University of Birmingham), DCT OMFS (King's College NHS Trust) and Bilal Ahmed, Specialist in Oral Surgery, Birmingham Dental Hospital and School of Dentistry, University of Birmingham, UK. 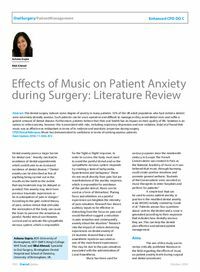 Objective: To provide evidence for the effectiveness of music in managing patient anxiety during surgical and dental treatment.